We ‘ve not rung the bells at Isle of Dogs regularly for two years due to mobile phone equipment being installed and loosing a couple of members the band. However yesterday we were teaching five new ringers on silenced bells and the simulator from 6.30pm, and removed the silencers at 8pm for an open practice, but forgot to close the sound control. 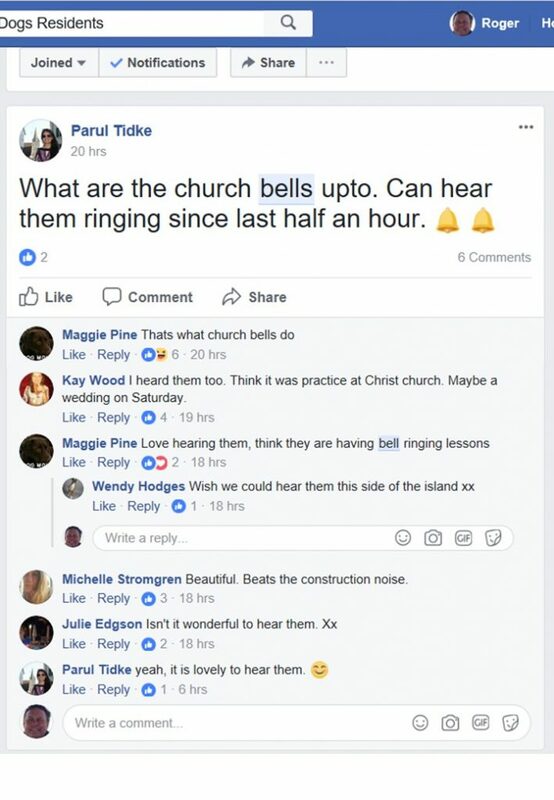 Imagine the surprise this morning to find that local residents had heard the bells and posted about it on the Canary Wharf and Isle of Dogs Residents Facebook group! Perhaps we should leave the sound control open more often! This entry was posted in News, Training, Uncategorized and tagged ART, bellringing, docklands ringing centre, Isle of Dogs, learn to ring, Learning the Ropes, New ringers, recruitment on 14 September 2017 by Roger.